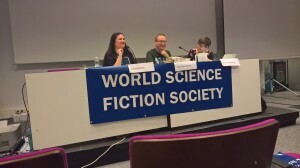 I almost didn't make it to Worldcon 75. My taxi was 15 minutes late picking me up from home, and then encountered serious traffic en route to Zaventem airport. I was far too late to check my bag and brought it through security, where I almost came unstuck because of the Official Hugo Glue, which Dave McCarty had given me at Smofcon in December and I now needed to give back to him. 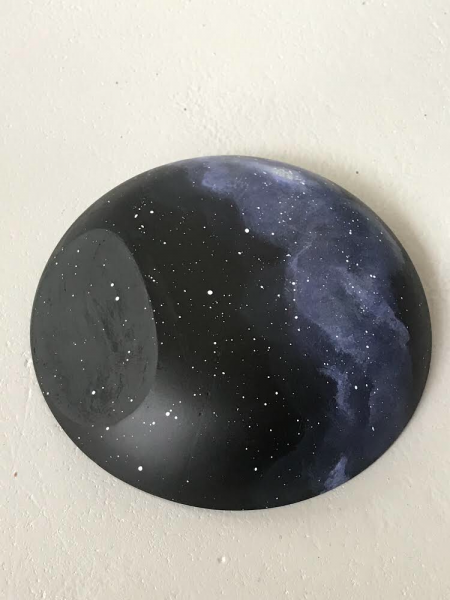 (In fact we did not need it, as the artist who created the bases had engraved the winners' plaques and attached them to the bases herself.) Five different security officials inspected the Official Hugo Glue Gun (which fortunately in Dutch is not a gun but a "lijmapparaat", glue machine) before I was allowed to go on my way. The captain of my plane then scolded me, entirely fairly, for bringing "hand luggage" which was, in his words, "way too big". But he did not throw me off, and I arrived in Helsinki. 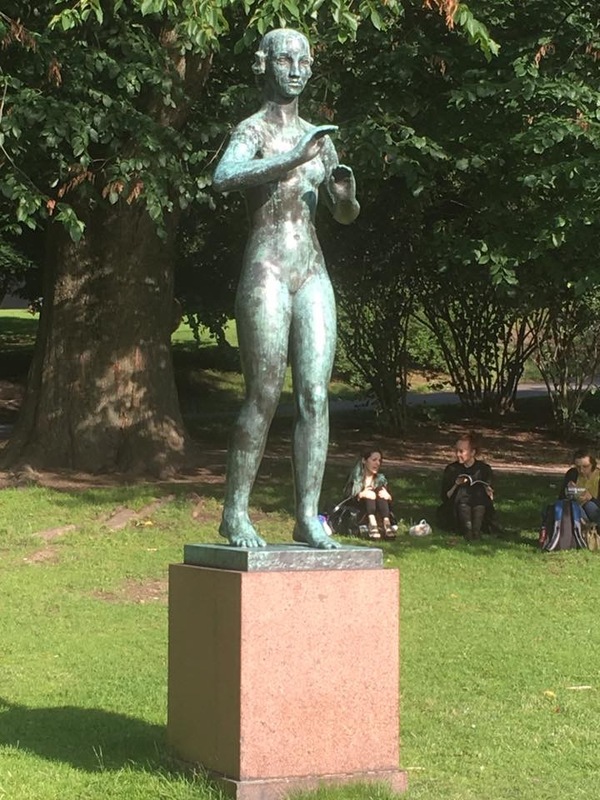 Apart from the massive storm on Saturday night, the weather in Helsinki was lovely, and I had a very nice walk from the railway station to the City Hall on Tuesday, detouring to inspect the three statues by Victor Janssen for which his daughter Tove modelled. 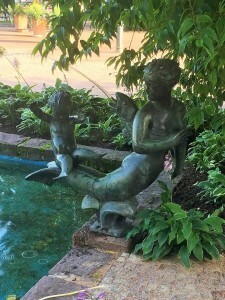 One is in the park just northeast of the railway station building, one is in a nook off the southwest corner of the Esplanade, and one is at the eastern end of the Esplanade. 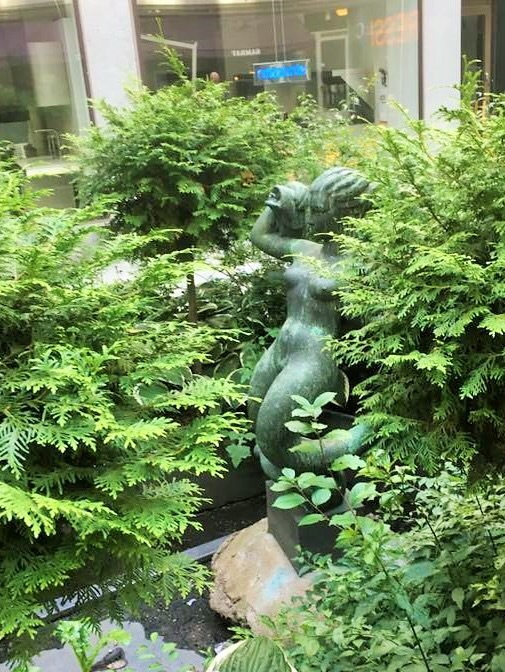 The first was made when she was still a teenager; the two mermaids date from the time shortly before she began writing the first Moomin stories (she is the larger of the two in the last sculpture). The newly elected deputy mayor of Helsinki, whose Afghan parents successfully sought asylum in Finland when the Taliban took over in 1993, hosted several hundred of us at an excellent reception that evening. A number of us then convened at a karaoke bar, where my division head Michael Lee filmed me duetting on Meatloaf's "Paradise by the Dashboard Light" with his deputy Kate Secor (video only visible to Facebook friends of the three of us). I managed to avoid doing an encore. Kathryn and I started Wednesday by actually putting the cards announcing the winners in the envelopes. To preserve confidentiality the Finnish printers had prepared 126 cards (six finalists and "No Award" for each of the 18 categories). With Oscars in mind, we checked each card three times before sealing its envelope. Suddenly it all felt rather final. The usual practice has been for the Hugo administrators to hold an open competition for the Hugo base design. I felt very strongly that this year it should be a purely Finnish process, and therefore delegated it back to the Finns. They ran a competition open to Finnish residents only, and came up with a beautiful and economical base designed by Eeva Jokinen; as she described it, "a simple shape which gives room to both the shape of the rocket but also to the reflection between two worlds, imagination and reality". Most of the rest of Wednesday was spent physically assembling the Hugos. 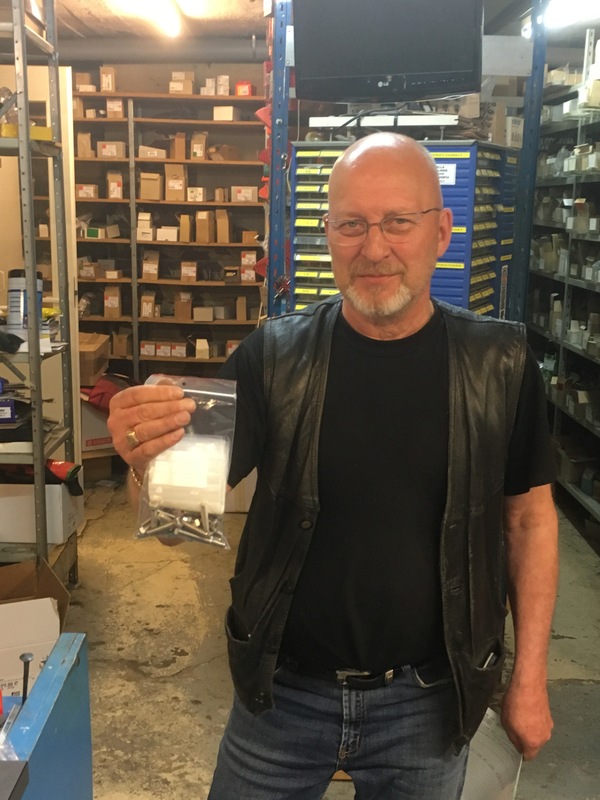 45 rockets had arrived from the Devon foundry once owned by the late former Worldcon chair and British super-fan Peter Weston; 40 bases from Eeva Jokinen. But we realised on unpacking that we had no bolts to attach the one to the other (Eeva had at least supplied washers). So Kathryn and I had to borrow a car (belonging to our other Vice-Chair, Karoliina Leikomaa) and scour the streets of Päsilä looking for bolts. 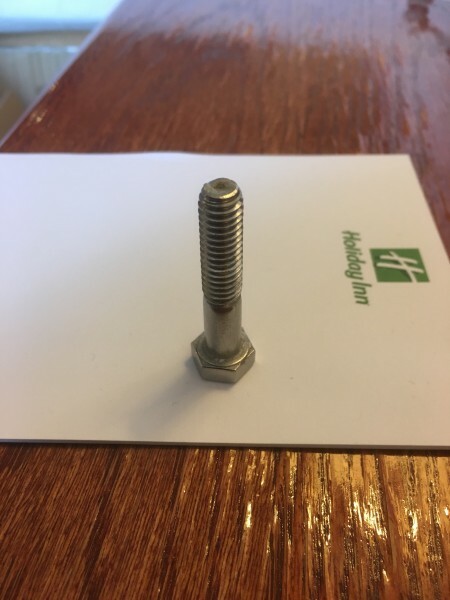 The chap in the first shop we went to looked dubiously at the one bolt we had, and compared it with his stock. He shook his head. "That is not millimetrical", he told us, and referred us to another establishment. 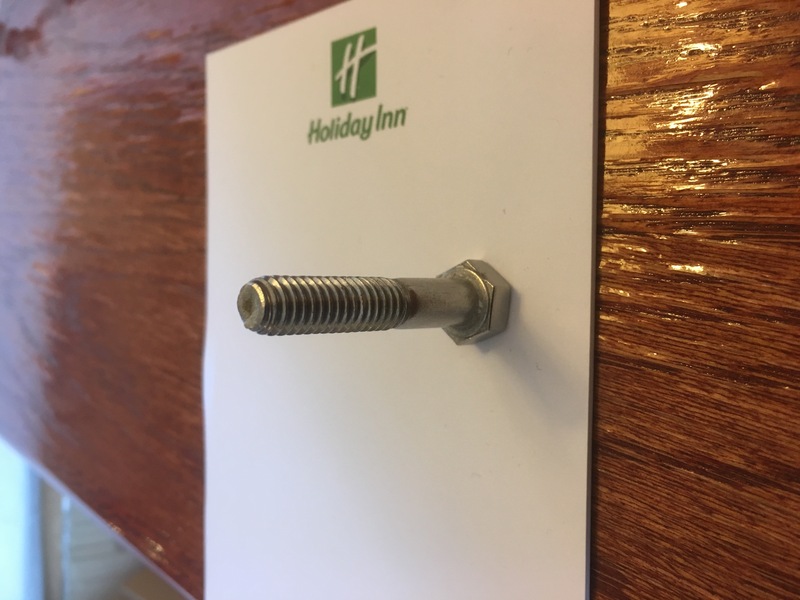 (Indeed - the bolt specification is 5/16"-18.) This turned out to be Ruuvi-Säve Oy, in the basement of a building fairly near the convention centre, where the necessary material was indeed available. The proprietor is a short bearded chap in an underground workshop. I will say no more, except that he was very helpful. 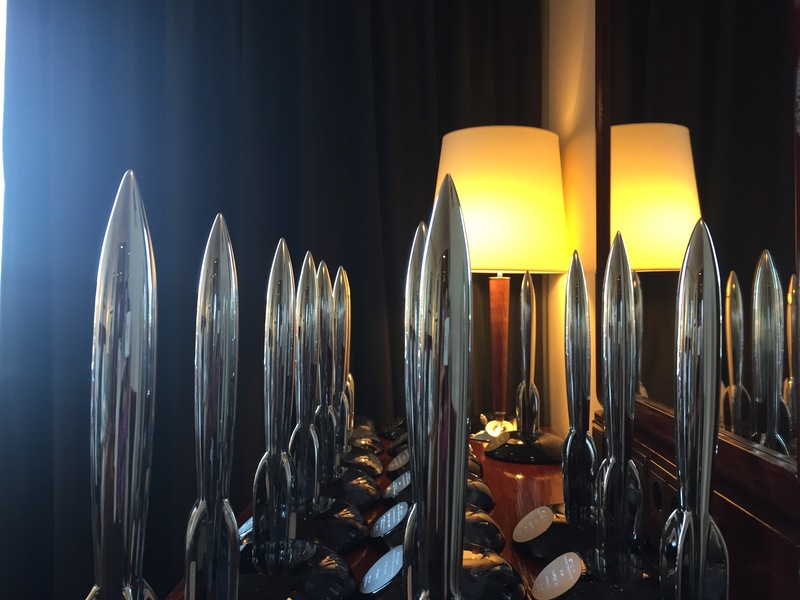 We developed quite an assembly line to put the Hugos together in Jim Beatty's room, realising that we only needed 21 for the actual ceremony - the Campbell Award is not a Hugo, but three categories had two acceptors and we also needed to present one to the sculptor. It took the rest of the afternoon, but they looked fantastic. Kathryn got a great picture of them on Jim's desk, reflected in the mirror. I posted the top half of it that evening, to tantalise people; here is the full image. Jim, whose hotel room we co-opted, is the father of the Hugo ceremony coordinator Joshua Beatty, yet another of Colette's contacts, who had never been to a Worldcon before but spends a lot of his time organising events in the DC area. 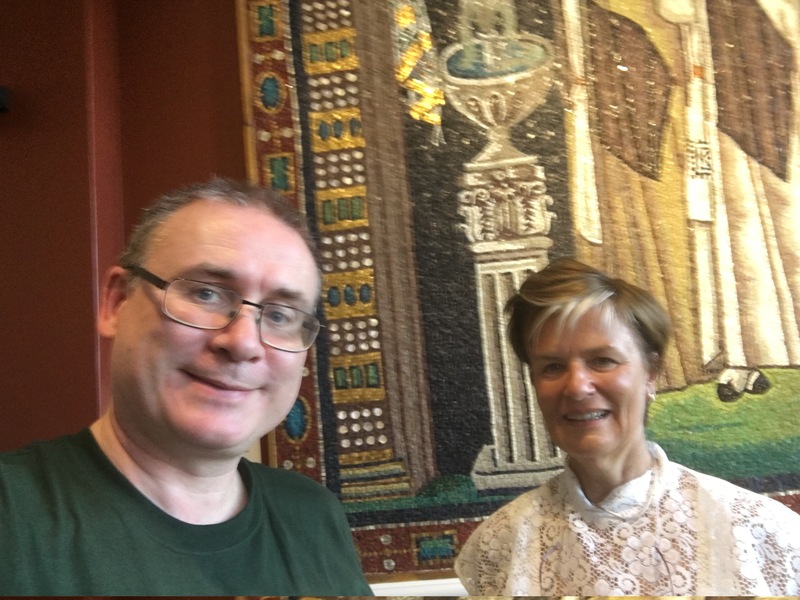 We also knew we would be working with the convention's Toastmistress, Karen Lord (whose Redemption in Indigo I hugely enjoyed when she was up for the Campbell Award). The synergy was great from the start. The December 2016 Smofcon meeting in Chicago was pretty useful for our initial planning - the organisers of MidAmeriCon II's Hugo ceremony did a presentation on their own planning process, and Colette and I patched Joshua (and Maciej Matuszewski, Helsinki's Events DH) in by Skype. We decided as a result that we would continue MAC2's break with tradition, and present the awards in a different order to that in the constitution - basically moving Best Series and the Campbell Award to the end rather than the beginning of the ceremony, to make it flow better; we already knew that it was going to be long. I also proposed that 1) we get the Guests of Honour to present the later awards (which is normal enough procedure), 2) we get a Finnish politician to present Best Novel (and Jyrki Kasvi, the Green MP who had campaigned in Klingon, was an obvious choice), and 3) that George R.R. Martin should present the Best Series Award. GRRM himself then suggested that we should invite Game of Thrones actor Sibel Kekelli to present one of the Best Dramatic Presentation categories, which was obviously a good idea. After that I largely left Joshua to it, as he clearly knew what he was doing. One completely external event - on the evening of Sunday 26 February for locals, but I read about it live as I was getting up on Monday morning in Belgium - had a major impact on our thinking: the débâcle of the Oscars ceremony, where the wrong winner was announced for Best Picture. This is inherently less likely to happen for the Hugos, where it's rare for anything or anyone to be a finalist in more than one category, but problems have happened before and we decided to take strong preventative measures. Every envelope would be physically attached to the right position in the ceremony script with adhesive tape, and would be clearly labelled with the relevant category and finalists; and the cards indicating the winner - and only the winner - would also be clearly labelled by ballot category. As it turned out, these precautions were wise. A completely unexpected intervention then came from Guinness World Records, who informed us that they had determined that the Hugos should be recognised as the longest running sf award, and they proposed to present a certificate to this effect at the ceremony. Walter Day came over from the US for this purpose, and we had a nice little video from Craig Glenday, the Guinness Editor-in-Chief. One last-minute change to the ceremony came when Claire Wendling, one of the Guests of Honour, fell ill just before the convention and could not come at all. Looking through the members, we agreed that Maura McHugh would be the most appropriate replacement to announce the Best Graphic Story category, and she agreed. Unfortunately I failed to spot that the script for that part of the ceremony had omitted the artists and listed only the writers, though at least the slides on display had everything; a mistake for which we justifiably got some flak. I had tapped Ian Moore to run the PowerPoint display during the ceremony, but Joshua eventually decided (probably rightly) that he wanted to take responsibility for that himself. Instead Ian found himself doing an extensive last-minute check of the In Memoriam scroll. (I think I have known Ian for longer than anyone else at Worldcon 75, with the exception of Cheryl Morgan who I first met around 1985.) We caught most of what needed to be caught, though I apologise in particular to Mary Kay Kare for the mis-spelling of Jordin's name which crept in at a late stage. At the last moment of preparation I got sidetracked, and Kathryn took charge of transporting the Hugos, and the Campbell Award and regalia, down to the ceremony and arranging them in the right order. Some sandwiches were hidden backstage for us, which was just as well as there was not much to eat at the pre-Hugo reception (otherwise expertly coordinated by Heidi Lyshol). And then, we were on. I had not read the final version of the script and was taken by surprise when, immediately after I had been introduced by Karen Lord, Imperial Stormtroopers appeared on the stage with Jukka Halme, the convention's Chair, as their hostage. It was very funny though. That of course meant my phone went to sleep and I had to fiddle with it embarrassingly to retrieve my own remarks. Kathryn and I then introduced the base with Eeva, and formally received the Guinness certificate from Walter Day. And then I sat back, shuffling between backstage and an obscure seat in the wings and aware of what could have been better. The livestreaming did not work (I understand that this was force majeure, but don't know any more). I've mentioned the Best Graphic Story slip above. There were very few printed voting reports available to distribute after the ceremony (this was entirely my fault). I had not realised that Ted Chiang was present at the convention, and it would have been great to involve him in the Hugo for Arrival. And of course one presenter actually did open the wrong envelope. Fortunately, thanks to the precautions we had taken, he realised what had happened immediately, put the card back and swiftly turned to the right envelope. It could have been worse. But otherwise, what was a long ceremony went smoothly and (as far as I could tell) enjoyably, with all of the winners delighted (we had 10 of 18 categories represented in person, another 4 with designated acceptors, and 4 with prepared remarks read by the Chairs team and Karen Lord), and people were congratulating me on it for the rest of the weekend (I told every one of them that Joshua deserved all of the credit, along with Karen). I understand that the video will likely be online at the end of next week. The Hugo Losers party was truly epic. 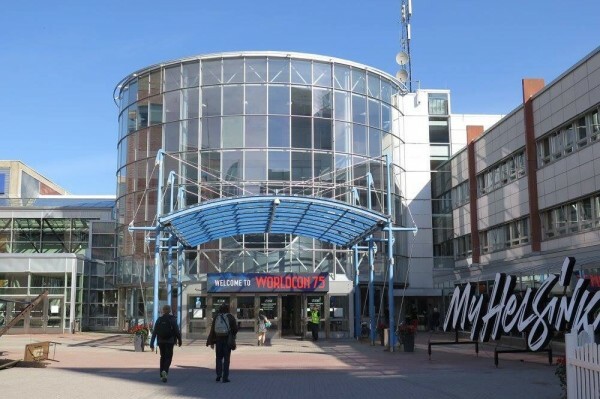 Worldcon 76 in San Jose, together with George R.R. 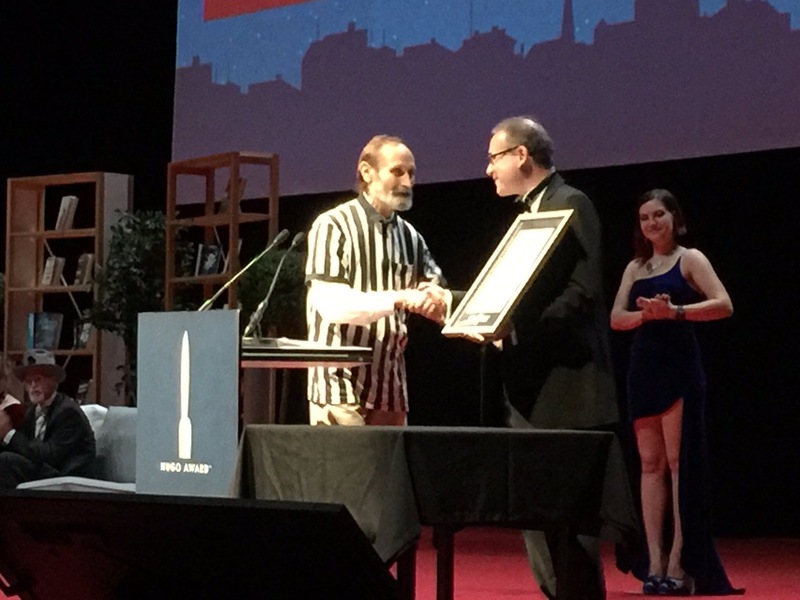 Martin, had booked a steampunk pub in downtown Helsinki and filled it with Hugo winners, finalists and staffers. The gin flowed freely. I had a real blast. As mentioned earlier, my two work colleagues both came to the party as well. 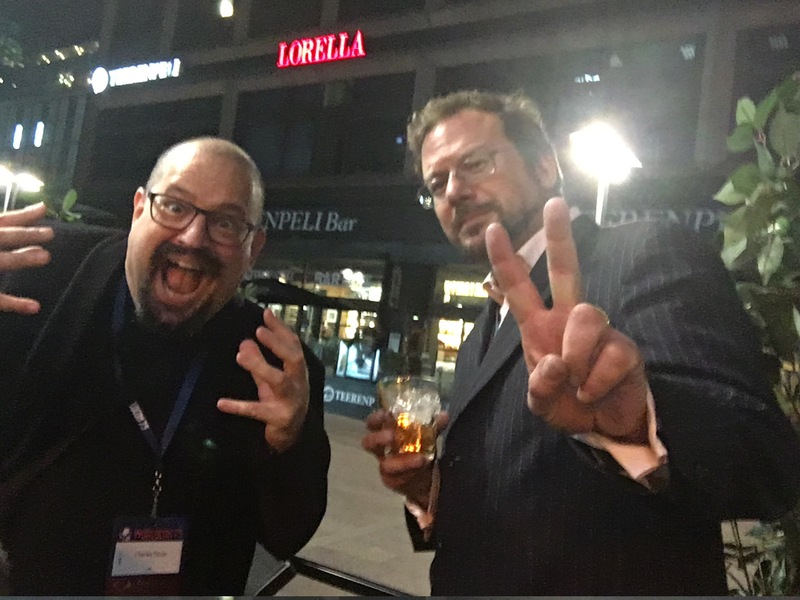 One of them is a fan of Charles Stross, so he was happy. The other is a fan of Hamilton, so she was happy. I stayed until about 3 am and Catie Murphy then forced me to go home. 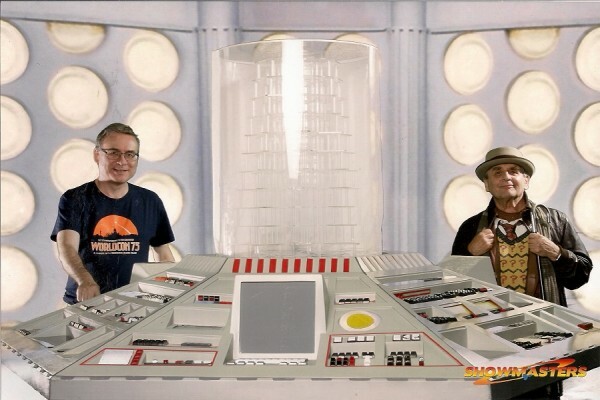 We had made the early decision to hold the Hugo ceremony on the Friday night, night 3 of the Wed-Sun convention, rather than the traditional Sunday, night 4 of a Thu-Mon convention, for a number of reasons. I think in retrospect that while it was worth experimenting, it did remove the momentum towards the last evening that the Hugos can often provide - the Masquerade just doesn't attract the same level of attention. I would make a pretty firm recommendation to future Worldcons to keep the Hugo ceremony on the last evening. I had given very little thought to how to actually transport the Hugos to their eventual recipients. Fortunately Joshua, combined with Phil Davies of the Con Office, took this on with his usual efficiency; and while I did spend some time on Saturday and Sunday sorting out minor details, it seems likely that all but one of the awards will have reached their intended destinations by the end of this week. It's always tough getting to programme items if you are on staff at a Worldcon. 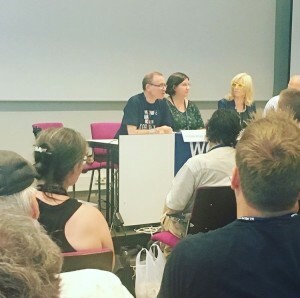 I was a speaker on four panels - one on Fantasy and Freedom of Movement (a few seconds are around the five-minute mark here, Finnish write-up here); one on Boot-Strapping a Nation, which partly commemorated Finland's centenary; one on The War on Science; and one on the future of the Hugos. As usual, fellow panellists and audience were up for a good conversation. I attended only one talky programme item other than the four I was on. This was a brilliant presentation by Sonja Virti of the illustrations drawn by Tove Jansson in 1962 for a Swedish translation of The Hobbit. In a lovely bit of "but of course they would have known each other", she was invited to do the job by Astrid Lindgren, the creator of Pippi Longstocking. Sonja presented the links with Tove Jansson's illustrations of her own work, particularly "Who Will Comfort Toffle?" (which I admit I haven't read) and also looked at how her reading of The Hobbit differed from that of other artists, including of course Tolkien himself. 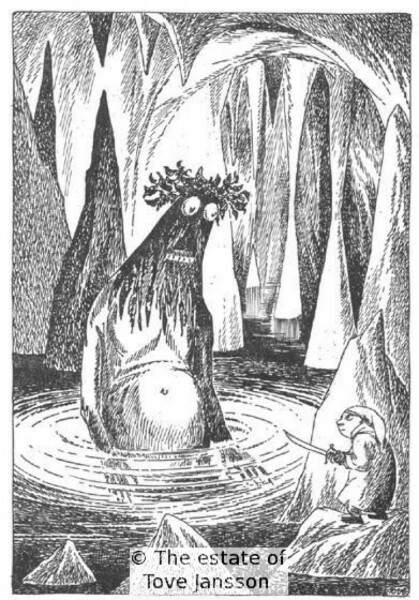 Jansson's Gollum is a huge, troll-like figure; it was not until 1966 that the English version of The Hobbit was revised by Tolkien to describe Gollum as "a small, slimy creature" - of course, it's clear from The Lord of the Rings, but presumably Jansson (and Lindgren?) were unaware of it. Only the Swedish and Finnish editions of the Hobbit are permitted to use Jansson's illustrations by the Tolkien estate. 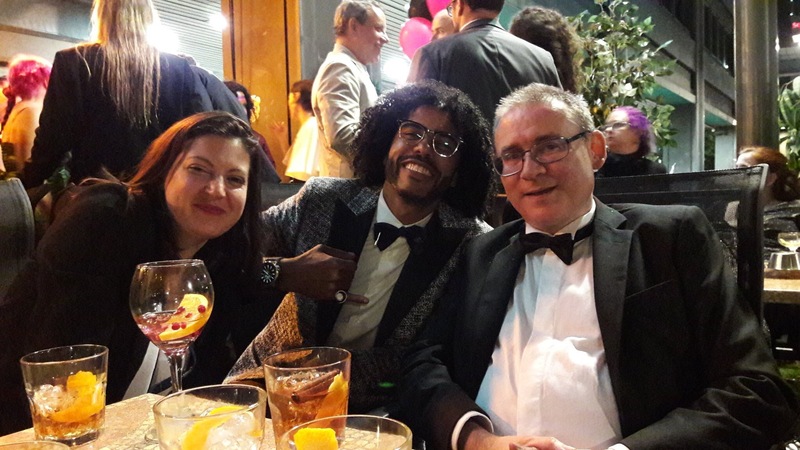 My only other programme item was a fiendishly difficult quiz on A Song of Ice and Fire where my work colleagues and I linked up with Tav from California and did very badly. My colleagues on the other hand went to loads of programme items and enjoyed them all. It was my third Worldcon but my first time attending the WSFS Business Meeting, which has the power to amend the Hugo rules. I spoke six times altogether - Thursday at 1:05:25, Friday at 37:24 and 49:49, Saturday at 1:20:30, 1:46:50 and most substantively at 2:22:50. It is quite a drain on time for other things - most of the morning on four of the five days. Fortunately Twitter coverage made it easier for me to spot when to slip in for the parts that concerned me most. I had resolutions on the table on all four days, all of which passed, except for the proposal to move to Three-Stage Voting (which I had anyway changed my mind about in the meantime). As a result of one of those resolutions, I have been appointed to a committee, chaired by Vince Docherty, which is to look at the Hugos in the round and propose any changes which it may deem necessary to the 2018 WSFS Business Meeting (this being an amendment of our original proposal to just look at the Best Artist categories). I won't be in San Jose myself, and I hope that anything that is proposed and passed there is robust enough to get ratified quickly in Dublin. In general I hope that, after the drama of the last few years, the Hugos can settle down again soon. My mind was so fried by five days of convention (and two years of preparation) that I missed my plane home on Sunday night. I could make excuses, but really it was the rookie mistake of getting the departure time wrong. I did at least realise what had happened in time to shift my reservation to the following day, enjoyed the evening parties that I had expected to miss, begged a spare bed for the night and flew home early on Monday morning, tired but happy, and four hours late for our two-day drive across England and Wales to Ireland. My suitcase, containing a number of spare trophies and my own souvenir Hugo base, did not make it onto my flight; I can only imagine the consternation among the security staff when they X-rayed it and saw six two-foot metal rockets inside. However, it too made it back to Belgium in the end and is sitting in my office waiting for me as I write. And I am doing it all again. 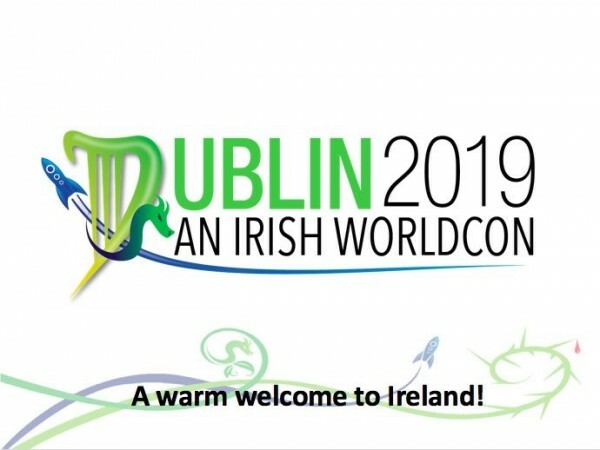 One of the threads of my ongoing conversation with Vince Docherty was his role as head of the WSFS Division for the Dublin Worldcon in 2019 (official name: Dublin 2019 - An Irish Worldcon), and the outcome of that was that I have accepted the role of Hugo Administrator for that year too (Dave McCarty is doing it next year). 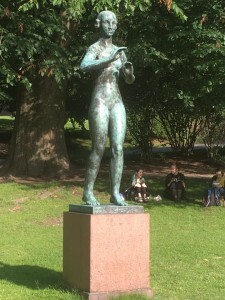 I had six conversations about it on the Sunday of Helsinki, including with my new deputy, Niall Harrison, who shares my deep love for the Hugos, is super-organised, and is only one timezone away from me. We will have the same voting system as this year, and at least 19 categories - this year's 18 plus the new Young Adult award, plus another if the Dublin 2019 committee should so decide. Why did you have your notes on your phone, instead of a printout? For the backlight? Thanks for all your hard work on the 2017 Hugos. It was a pleasure sharing a panel with you. 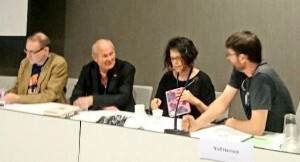 Also thanks also for attributing the photo of the Digital Hugo panel to my Mom. 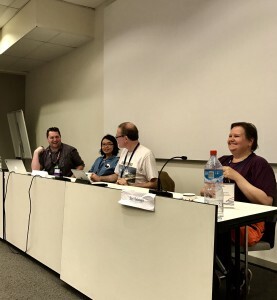 Coincidentally, this is the only good photo of any panel I was on that I have, since my Mom is not very good with digital cameras. Tom Galloway, head Hugo Ceremony usher here. I was very confused when we opened the boxes that supposedly had the result sheets to pass out and discovered they actually had WSFS Business Meeting materials. Other boxes in the same backstage location had 5 different 10 or more page results and nominations reports. I made the decision to pass out about half the box of the most general results reports, as we only had a minute or two before the ceremony ended. I later told Kevin Standlee what happened and he was trying to get the initial stuff to the WSFS meeting room. Meanwhile, the other report boxes had disappeared. Yes. You made a good decision based on what was to hand. I should have checked what was in the boxes much earlier. Thank you for all your hard work! As a non attending fan / finalist, I loved the friday slot for the ceremony. As a possibly attending fan next year, I'd love to see the ceremony next year on Friday or Saturday night for logistics / travel purposes. I prompted some discussion of an "Interactive Narrative" category at the Writing for Video Games Panel. I would entirely endorse such a category. I think the term "Interactive Narrative" was generally accepted as the best basic definition. I do wonder if there should be an "expected play-time" limit, perhaps with a cut-off of Eight Hours. To encourage games that lean in the Dense Narrative direction, which is very hard to actually define in strict terms. Very enjoyable look into the background of the Hugo process. Thanks for all the hard work.